Home » Archive » Topics » Facility Management » Friday Funny: Christmas lights gone wild…the commercial version! Friday Funny: Christmas lights gone wild…the commercial version! Last December, FacilityBlog introduced readers to the “Christmas Light Stylings” of Carson Williams, who, according to Google, became an instant celebrity in 2005 when he programmed music and lights on his home in Mason, OH. This year, Mason has taken his synchronized light display to a new level… two city blocks. With over 250,000 LED lights, 30 lighted trees, and a quarter-mile of lighted garland, the Holiday lights display at Northfield Stapleton is truly a one-of-a-kind Holiday experience. Running from November 18 to December 24, the Holiday lights show titled Symphony in Lights is once again synchronized to the music of the Trans-Siberian Orchestra. 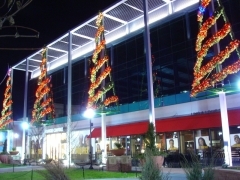 Northfield Stapleton is an open-air, 1.2 million-square-foot town center that combines major anchors, specialty shops, restaurants and entertainment in a pedestrian-friendly outdoor setting. “It’s imaginative, electrifying, and toe-tapping,” said Diana Fiore, director of marketing of Northfield Stapleton. “This has never been done before on this scale in a commercial retail center, and it certainly won’t be your traditional holiday experience,” she continued. The light show will also include train rides for children, complimentary gifts, as well as live musical performances. Don’t you just love the unspoiled, pure message of Christmas?